Is Brookfield Infrastructure Partners LP a Buy? This giant diversified infrastructure play offers investors a large and growing distribution. The world needs infrastructure like electric and natural gas utilities, pipelines, and roads. In the developed markets, aging assets need updating; in emerging markets, these types of assets are still getting built. Brookfield Infrastructure Partners L.P. (NYSE:BIP) is there to help on both sides of the equation. And unitholders can benefit along the way from a growing distribution and 4.8% yield. Here's why you might want to buy Brookfield Infrastructure Partners. Brookfield Infrastructure Partners owns long-lived infrastructure assets, including utilities, midstream pipelines, toll roads, railroads, ports, and more recently, data centers. These are often assets that we take for granted, but they are vital links to economic prosperity. And Brookfield's portfolio is global, with assets located in the Americas, Europe, and Asia. In effect, it offers investors a simple way to own a large and globally diversified infrastructure portfolio. The word "portfolio" is important. Brookfield Infrastructure is an active buyer and seller of hard assets. The partnership specifically looks to acquire infrastructure assets when they are out of favor, and will sell them if it can get a price it deems worthwhile. Profits from asset sales are used to invest in new assets. For example, through the first nine months of 2018, it sold an asset for $1.3 billion and bought six assets for a total of $1.8 billion. Brookfield Infrastructure has done an admiral job of actively managing its portfolio. The best example of that is the distribution, which has been increased every year for 11 consecutive years. The annualized growth rate since 2009 is 11%, with the most recent hike in 2018 being roughly 8%. That's right in line with its long-term target of 5% to 9% annual distribution growth. While distributions are a key metric to watch for income investors, the company's ability to profitably buy and sell assets over time has also been quite impressive. Since its inception, it has sold 10 businesses, generating cumulative internal rates of return on these assets of around 25%. The average holding period was eight years. 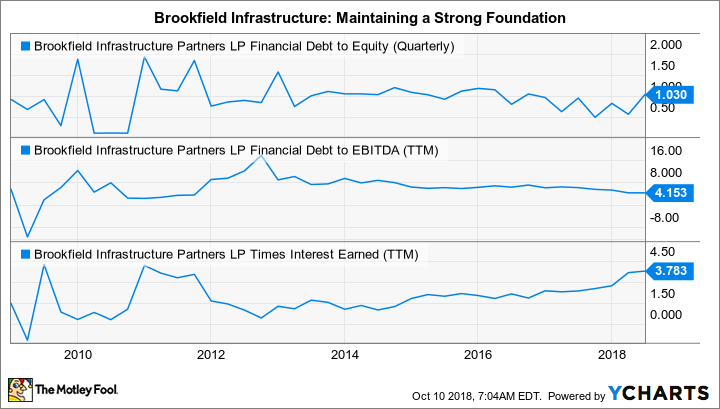 A key feature here is that Brookfield Infrastructure does more than just routine maintenance when it buys assets; it focuses on running the assets it owns well and improving them. The asset sales, as noted above, generate cash that can be used to fund future investments. However, the company also has a policy on trying to self-fund as much of its investment as possible. The distribution, despite solid growth over time, is pegged at roughly 65% of funds from operations. The rest goes to capital spending for regular maintenance and growth investments at existing assets. When you step back, Brookfield Infrastructure has a repeatable model that has worked very well so far. BIP Financial Debt to Equity (Quarterly) data by YCharts. That said, investors need to keep an eye on the partnership's leverage. Based on the businesses it buys, it makes sense for Brookfield Infrastructure to use a lot of debt. The partnership's debt to equity ratio is roughly 1, which is reasonable. Debt to EBITDA is currently around 4.2 times, also a relatively strong number. And times interest earned is a little under 3.8 times, a solid, but not incredible, number. It's credit rating is BBB+, the lower end of investment grade. So there doesn't appear to be any reason to worry about the balance sheet today, but it's an issue to monitor. Brookfield Infrastructure has done a great job of managing a diverse portfolio of infrastructure assets, and it has rewarded investors well along the way. There's no particular reason to believe it will suddenly stop on either front since it has a well-laid-out plan for running its business. That, in turn, provides you a yardstick by which to measure performance. Meanwhile, the unit price has fallen over 10% from recent highs, which seems like an opportunity for long-term investors to pick up a well-run, high-yielding infrastructure investment on the cheap -- assuming they understand the active nature of the portfolio.